I don’t care how big and bad you are — everyone has had the unfortunate experience of being bullied at one point in their life. It comes in the form of physical, emotional, or psychological torment and can happen at home, school, work, or the internet. One’s initial response will dictate whether the problem is corrected or, if not addressed, can lead to mental health problems, such as anxiety, depression, and others. Certainly one cannot place blame on the victim since it is often a random occurrence. However, since bullies tend to be opportunists searching for easy prey, there are things you can do to avoid being targeted. Helping your children learn to deal with bullies is a learned skill, which they will utilize throughout their lifetime. The hurdle, however, is that people who have been bullied, often don’t want to talk about it because they feel hopeless, embarrassed, or intimidated. The first step is to normalize it for them by letting them know that it happens to everyone and that there are steps they can take to prevent it from happening in the future. The hurdle, however, is that people who have been bullied, often don’t want to talk about it because they feel hopeless, embarrassed, or intimidated. Let your children know that it’s not their fault. Bullying happens because some people have problems, which they sometimes take out on others. Nothing they did or nothing about the way they look has caused this to happen. Normalize the occurrence for them and assure that it will get better. Contact the school principal or local authority immediately. This problem must stop immediately and the school is responsible for providing a safe environment. Make sure you have your facts straight about specific incidents. The principal or authority should contact the bully’s parents so that they can get their child help. Teach your child how to handle themselves. Children should be encouraged to walk away from bullies and not engage them if possible. Try to stay around places where teachers or other staff is present. Tell your children to stay in groups or at the very least use a buddy system (preferably a big buddy) to get around. Be optimistic and give them the “go ahead” and skills to defend themselves. Try to let them handle it, with your guidance, as much as possible so you don’t take the power away from them. Teach them to be assertive and carry themselves in a confident manner. Bullies tend to target easier pray who may appear afraid. While this may be a normal reaction, they can take certain steps to demonstrate that they are not a push over and if push comes to shove, they should defend themselves to prevent bodily harm. Awareness leads to prevention. Make sure that they are aware of their surroundings and “on the lookout” for trouble. This is a skill that will improve in time, but that they you can practice with them to demonstrate how to locate individuals who are targeting others. Speak up. Teach your child to use their tough and loud voice to verbalize commands like, “Stop it” or “No.” Bullies often count on their victims to freeze up due to fear and intimidation. Therefore, practice with your child and help them find their strong and assertive voice. Bullies have issues and want you to react. 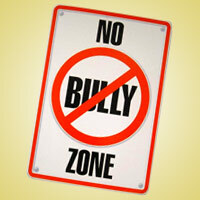 Let your children know that they have to rise above engaging in any verbal or physical altercation with a bully. Bullies will try to get to you by making fun of you and calling you names. Let your children know that the bullies are troubled themselves and will try to bring others down with them. Practice makes perfect. Show them the difference between the three approaches of being aggressive, assertive, or passive in handling a situation. Either extreme of aggressive or assertive behavior is not healthy. However, being able to get your point across effectively is invaluable. I use role-play to review scenarios with my kids such as standing in line at the supermarket and someone cuts in front of you. I go over the various responses they may have and discuss the benefits and drawbacks of each. When the time comes for them to react in a real situation, and their “fight or flight” instincts kick in, they’ll fall back on what they practice.